In general, I'm not really a bossy person (except to my little sister. Hi, Hope!). But I'm about to boss you around. You must. MUST. make this pie for Thanksgiving. I don't care if you already have five pies on the menu; make it an even six. This pie is sooooo worth it. I know sweet potatoes can be kind of divisive, but I served this to two self-proclaimed sweet potato-haters, and they both loved it. 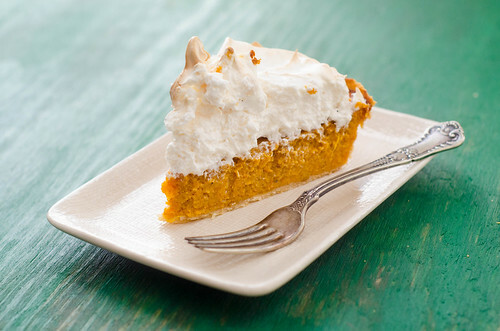 So here's the breakdown: a standard pie crust, a smooth and creamy spiced sweet-potato filling, and a marshmallow-meringue topping. The whole thing is quickly browned in the oven just before serving to give you that awesome toasted marshmallow flavor. The sweet and fluffy marshmallow topping is a perfect contrast to the subtly spiced, smooth, and creamy filling. It is a multi-step process, but nothing is difficult or tedious. And you can split it up over two days or so as well - make your pie dough and cook the sweet potatoes the day before, then assemble and bake it the day of. 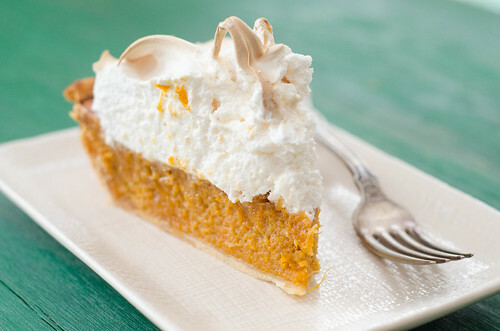 Or make the pie the night before, then just prep the meringue topping the day of. I will probably never serve a pumpkin pie again on Thanksgiving, because no one would even touch it with this sweet potato pie on display. It's a showstoppingly gorgeous pie - look at that pillowy mound of marshmallow meringue! I know that sweet potatoes are a quintessential Thanksgiving side dish, and it may seem redundant to serve them as dessert too, but I promise that no one will mind. I have a few Thanksgiving recipes to share this week, but I had to start with this one. It's officially become a Thanksgiving tradition in our house. Prepare the crust: Preheat the oven to 425 degrees. On a lightly floured surface, roll the pie dough into a 12-inch circle; carefully transfer to a 9-inch pie plate. Fold the edges under and crimp the edges. Poke the bottom and sides with a fork, then line the pie with parchment paper and fill with pie weights or dried beans. Bake 9 minutes, then remove and discard the parchment and weights. In a small bowl, whisk together the egg yolk and cream, then brush over the entire surface of the crust. Return to the oven and bake an additional 6 to 8 minutes, or until the crust is golden-brown. Transfer to a wire rack and set aside to cool while you prepare the filling. Reduce the oven temperature to 350 degrees. To prepare the filling, whisk together all the ingredients in a large bowl. Carefully pour the filling into the prepared pie dish. It will be very full. Bake 50 to 55 minutes, or until the center of the pie is set, and a knife inserted into the center comes out clean. Wrap the crust with aluminum foil if it is browning too much. Allow to cool at least and hour before topping. Increase the oven temperature to 400 degrees. To prepare the topping, beat the egg whites in a stand mixer at high speed until foamy. Add the sugar 1 tablespoon at a time, until the egg whites form stiff peaks. Turn off the mixer and add one-fourth of the marshmallow creme. Resume mixing at medium speed, then add the rest in one-third increments, mixing well between each addition. 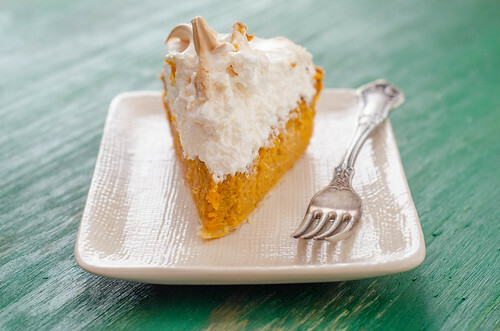 Immediately spoon over the pie and spread and "style" the meringue into peaks using the back of a spoon. Bake 6 to 7 minutes, or until the meringue is lightly browned. Serve. * To prep the sweet potatoes, prick a few times with a fork, then bake for about an hour at 400 degrees. Sweet potato pie is one of my favs!! LOVE this! I have never had sweet potato pie and am very uncertain about it but trust your opinion! Will have to try it. That meringue is definitely a showstopper! Hmmm I am now strongly considering altering my thanksgiving menu plans after seeing this!